I was nine, carving vast fleets of Man-O-War out of blocks of my mothers Ivory soap. Round tooth picks for cannon and masts, small squares of my fathers hankies glued to the tooth picks, for sails. We lived in Pittsburgh. This was not normal behavior in “The Burgh.” I honestly don’t know where this came from, but I saw an ad in Popular Science for a DIY sunfish-type sailboat. A sailboat of my own! I think the seeds for this were sown reading a kids book called Swallows and Amazons Forever. Its surprising but several blue water sailors I’ve talked to also mention this book as being influential. The next few months couldn’t have been pleasant for my parents. Once I commit to a heartfelt concept, well… let’s just say that I can get a little focused. To shut me up my dad relented and said ok but you’ve got to pay for it yourself. Great, my allowance would net me 50 cents a week, my other expenses were covered, and the plans estimated I’d need about $20. I humbly submit to you, dear Escapees, that one of my major talents is the ability to communicate my enthusiasm and passion for a particular idea or project to others. I soon had my mom sewing up the sail in a fashionable cotton sheet with black and white stripes. She remembered seeing a picture once with the sail full bodied and round, and she knew how to get my sail to look just like the picture. She ruched the foot of the sail and sewed in elastic just to be sure! Sure enough the plywood appeared along with lessons on my dads new jig-saw, and I just knew that I no longer had any budget worries. A short aside about budgets and boat building. It’s really simple. Just take the budget and throw it away. If you budgeted one week simply go up to the next interval, one month, now double it, that makes it 2 months to do the project. $20 becomes $100. It seems to help. About halfway through the Speedy project (I was 9) my Dad asked me where I’d learned to sail, I hemmed and hawed and he knew I hadn’t a clue. The next time we were in a book store I saw this little book and he had to buy it for me. I learned to sail by studying this book for weeks on end. I just dropped off my beloved Fatty Knees dinghy on semi permanent loan, to good friends in Surfside, FL. I gave them my how-to-sail book too. 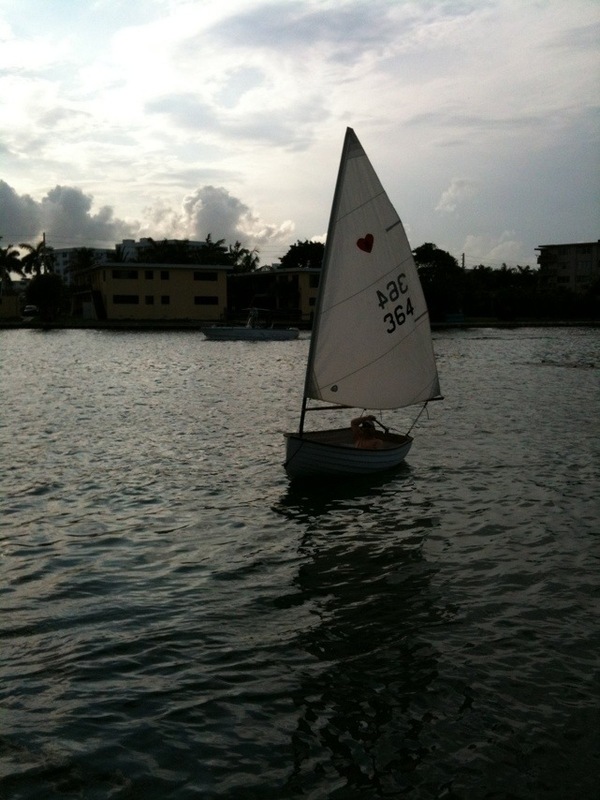 So if you see a jaunty, spunky little dinghy with a red heart on the sail around Surfside, stop and say hi. You know the owner. Awww. A sweet story, Jack. Your beloved dinghy is in good hands. You’ve got a bigger boat to sail now! I did not realize what book you were talking about till I saw the picture. Those Golden Books are the best books in the world. I had that one when little too, but had forgotten, and no longer have it. I do have 5 or 6 others though that I have saved all these years. Nice post, Jack. Very evocative of the times and what seems to be a somewhat obsessive state of mind required for the boat builder and ocean-going sailor.